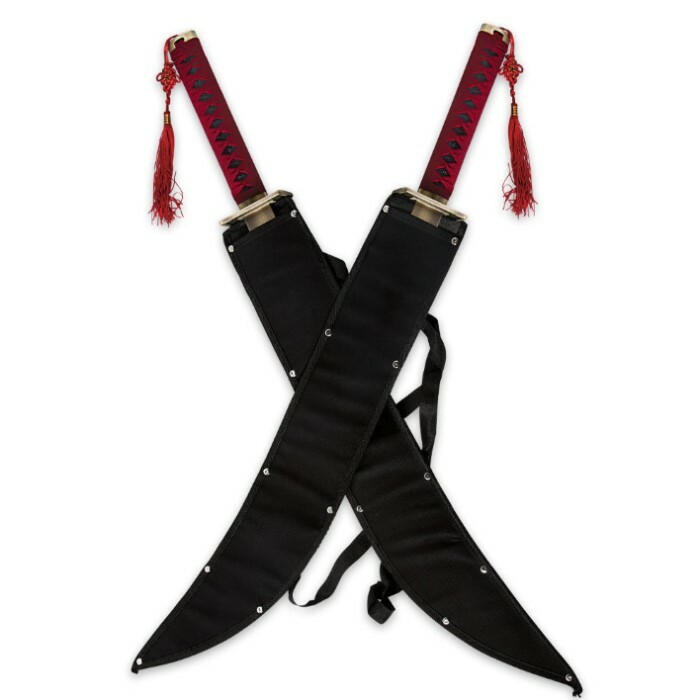 The anime edition of our Ninja Strike Force Twin Sword Set, these blades are full of style and appropriately sized to be worn while on the move. Similar in design to the blades of ancient scimitars, though certainly possessing a unique style of their own, the carbon steel blades have been electroplated to produce the two-tone finish and to protect against rust. Other features include all metal guard and fittings, hardwood handles with deep red cord wrapping, and a removable red tassel with mini key ring attachment. 18 in. blades, 26 1/2 in. overall. Please note: Current stock of this item includes tassels on the ends of the handles instead of the streamers shown in the photo. Before i bought theses i read others reviews on them, but im not the type of person take to much into people opinion on things to much so i had to buy them myself and like they sed their not sharp, which i dont really care about cause i wanted them as display piece anyway cause thought they looked cool. As or all the so called flaws folks been pionting out in the sword itself, mines are perfect! Great price for a nice set of swords, the only complaint I have about the swords is that they are quite dull although I just use them as a display piece anyways so it doesn't really take away from them. 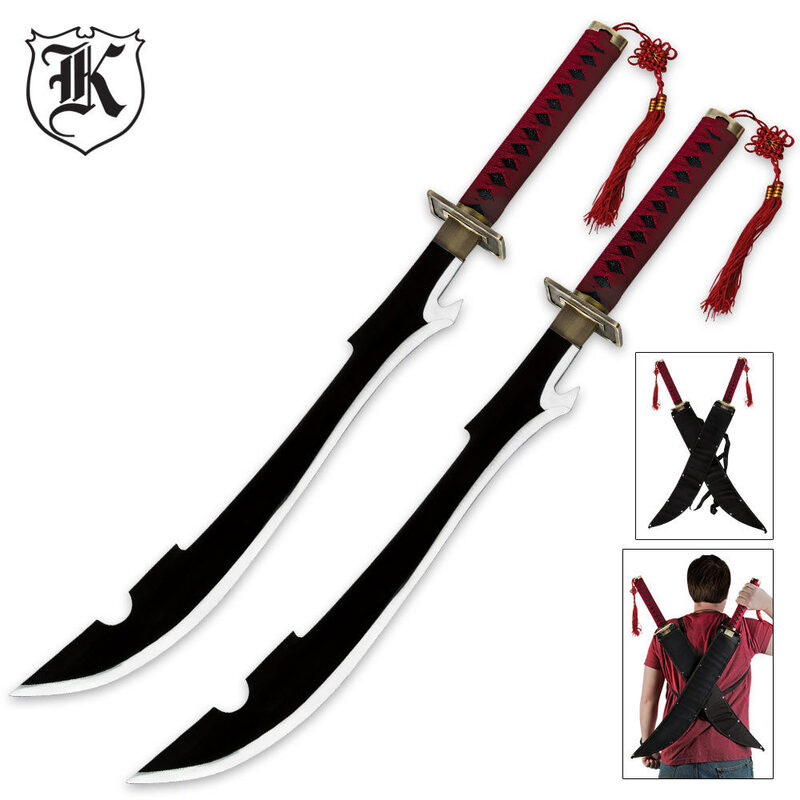 I love my new sword really good and very cool style another sword to my collection! Beautiful swords, but along the flat of the blade in the blck areas only there are slight imperfections such as bumps that become apparent upon either close scrutiny wit the eyes or a casual caress with the hands. I absolutely love these. The back strapped holder is crap because all the tips are sharpened and get stuck on the lining, so the sheath is for display only! Great weight on bboth swords, no instability or flaws, these swords are the perfect weapon for people who are a fan of using two blades at once.